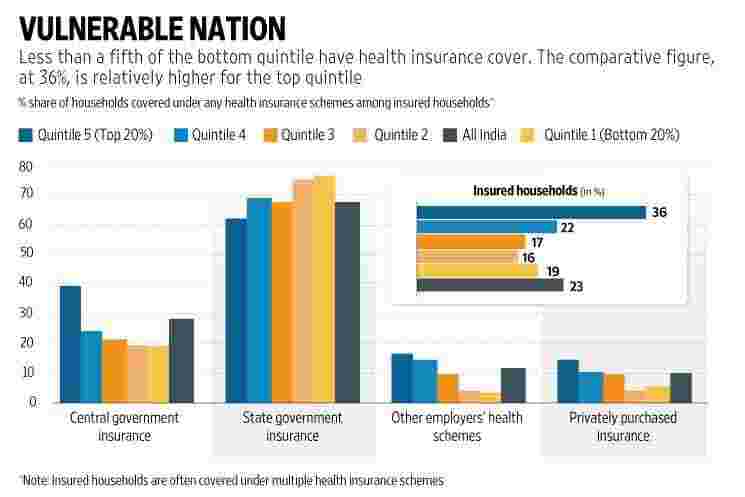 The low penetration of health insurance and high health costs expose Indian households, especially those at the bottom of the pyramid, to severe financial shocks, according to fresh data from a large-scale nationally representative survey. 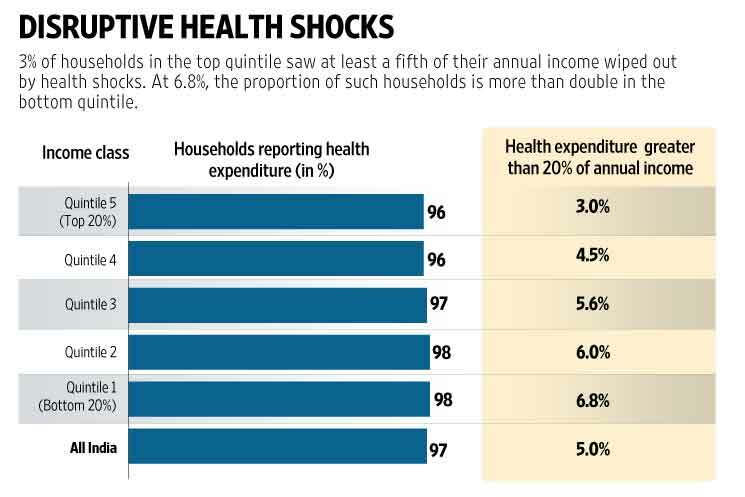 The ‘Household Survey on India’s Citizen Environment & Consumer Economy’ (ICE 360° survey) conducted this year shows that 3% of households in the top quintile (richest 20%) faced a health shock that wiped out more than a fifth of their annual income. The comparative figure for the bottom quintile (poorest 20%) was more than double at 6.8%. The survey shows a similar divide between households living in metros and those living in underdeveloped rural areas. The ICE 360° survey 2016, covering 61,000 households, is among the largest consumer economy surveys in the country. The response period of the survey was April 2015 to March 2016. The ICE 360° survey shows that 47% households consult a doctor at a public health facility when a family member falls ill while 38% households visit a private health facility; 14% consult an independent medical practitioner. The preferences of the bottom and top quintile households are roughly similar in this respect but the preferences of households belonging to the top percentile are very different. 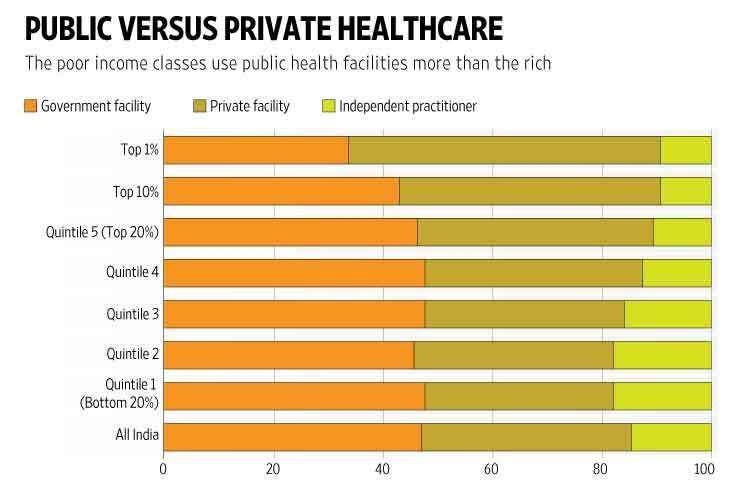 Among the top percentile, just 34% use a public health facility while the rest use a private facility or an independent medical practitioner when any family member falls ill. The survey also shows that just 23% of households in the country are covered under any health insurance scheme. Less than a fifth of the bottom quintile has health insurance cover. The comparative figure is relatively higher for the top quintile at 36%. 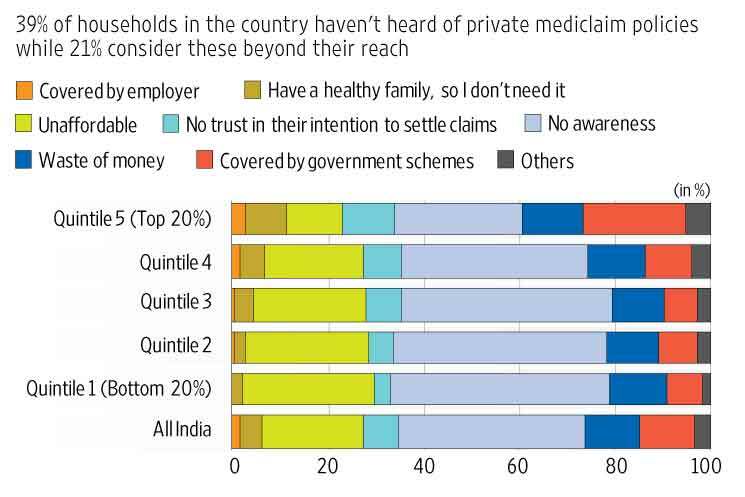 Among the top percentile, 42% have health insurance schemes. The penetration of health insurance, especially among the poorer income classes is because of public health insurance schemes rather than private health insurance (or the so-called mediclaim) policies. Nationally, 10% of insured households reported having purchased private mediclaim policies. In the bottom quintile, only 5% insured households reported purchasing private health insurance. In the top quintile, 17% insured households reported purchasing private health insurance. 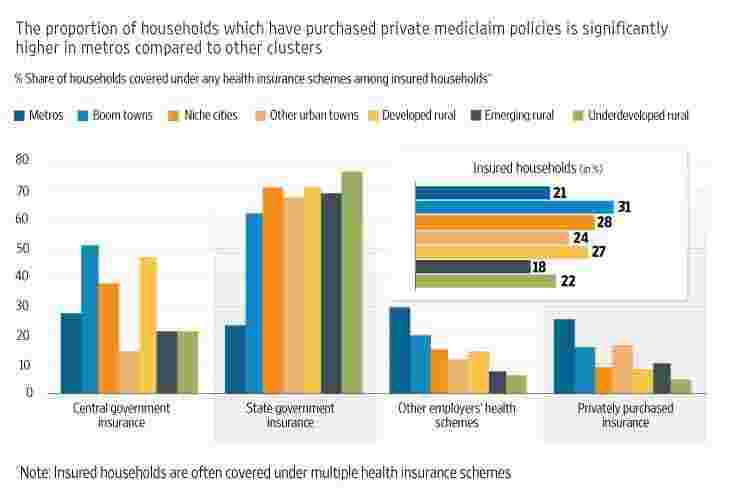 26% of the insured households in the top percentile have private health insurance cover. The low penetration of private mediclaim policies in the country is largely because of lack of awareness and lack of affordability, the survey shows. The fact that many more people are covered under public insurance schemes than under private ones, especially at the bottom of the pyramid, also indicates that affordability could be a key factor limiting the penetration of health insurance products in the country. Health insurance schemes launched by state governments seem to be more popular than those launched by the central government, the survey shows; 68% of insured households reported being covered by state government insurance schemes while 28% reported being covered by central government insurance schemes. The ICE 360° survey was conducted by the independent not-for-profit organization, People Research on India’s Consumer Economy (PRICE), headed by two of India’s best-known consumer economy experts, Rama Bijapurkar and Rajesh Shukla. The urban sample of the survey is comparable to that of the National Sample Survey Office (NSSO) consumer expenditure survey conducted in 2011-12. While the NSSO surveyed 101,651 households of which 41,968 (41.3%) were urban households, the ICE 360° survey covered 61,000 households of which 36,000 (59%) are urban households. The rural sample of the ICE 360° survey is less than half of the NSSO sample. Nonetheless, all the estimates of each region have been derived by adjusting for the respective population of those regions. A notable feature of the ICE 360° survey is that it is representative at the level of economic clusters. Urban India has been divided into four clusters: metros (population more than 5 million), boom towns (2.5 to 5 million), niche cities (1 to 2.5 million) and other urban towns (less than 1 million). Based on a district development index, rural India has been sub-divided into three different clusters: ‘developed rural’, ‘emerging rural’, and ‘underdeveloped rural’. The first category includes districts such as Bathinda (Punjab) and Kangra (Himachal Pradesh). The second category includes districts such as Latur (Maharashtra) and Kamrup (Assam) while the last category includes districts such as Kalahandi (Odisha) and Bastar (Chhattisgarh). In metros, 3.3% households witnessed a health shock, which wiped out more than a fifth of their annual income. The comparative figure is double in underdeveloped rural India at 6.6%, the survey shows. Overall health insurance coverage is lower in metros compared to other urban clusters, largely because of the low adoption of public health insurance schemes in metros, the survey shows. But the adoption of private mediclaim policies is significantly higher in metros compared to other clusters. 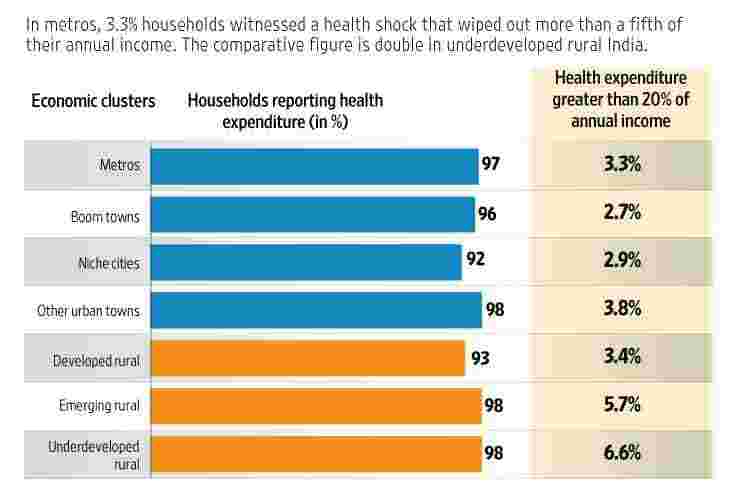 Data from NSSO surveys on healthcare expenditure also show that the penetration of private health insurance is lower among rural and lower income groups. A recent Brookings India research paper based on analysis of NSSO data on health expenditure of Indian households over the past decade by Shamika Ravi, Rahul Ahluwalia, and Sofi Berkgvist shows that private health insurance is largely limited to the richer urban households while public health insurance is evenly distributed among income classes. The study suggests that access to public health insurance schemes may not have lowered the health costs of households but has increased the likelihood of hospitalization. “This could mean that people suffering from ailments are more likely to be treated if they are covered by insurance," the authors of the study wrote. As an earlier Plain Facts column pointed out, the lack of affordable and accessible healthcare facilities in India often cause people to delay or avoid recognizing illnesses, let alone seek treatment for them. If public health insurance schemes are driving people to report their illnesses and to seek treatment for them, that in itself is a significant first step in the battle against ill-health in the country. This is the thirteenth of a 16-part data journalism series on how India lives, thinks, earns and spends, based on the latest results from the ICE 360° survey (www.ice360.in/) conducted by the People Research on India’s Consumer Economy (PRICE) in 2016. The next part will look at differences between single-earner and double- earner households.